Do you really need a recipe for an egg sandwich? I guess since I’m writing this, the answer is yes. I feel the same way about recipes for salads – dishes that are assembled rather than cooked don’t really need a recipe per se, but sometimes it’s helpful to see a certain technique or a combination of ingredients, or in the case of salad dressing, proportions. This “recipe” is here for the sake of my egg frying method, which I use to make what I would call skillet eggs. Skillet eggs are a kind of compromise between full on hash and a plain fried egg, for when I want just a few extras but mostly I’m in it for the eggs. I started making these after visiting my husband’s favorite breakfast spot in Colorado, The Egg and I, which has an incredible Mexican skillet – hash topped with your choice of egg (sunny side up) and chili (red), with a fresh flour tortilla on the side. My at-home variation is usually whatever leftover roasted vegetables I have in the fridge, the sunny side egg, a few dollops of Boulder Hot Sauce’s Smokey Serrano (which is wonderfully peppery and not too hot), sometimes with cheese, folded burrito-style in a toasted tortilla. * But recently I expanded the application of the skillet egg to a breakfast sandwich. Same cooking method, different style. The other innovation has been in cooking the perfect over-medium egg. This is necessary because when you are pregnant you’re supposed to eat fully cooked eggs (and unlike other food safety concerns for pregnant women, I actually follow this one because of the recent massive outbreak of salmonella), but dry yolks basically negate the point of the fried egg. 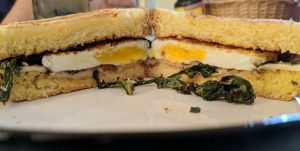 So here I present the skillet egg method in breakfast sandwich form. * The best way to heat a tortilla, either corn or flour, is in a dry skillet over medium-high heat. Wait until the surface starts to form little bubbles on one side, then flip and watch it puff up. It is a massive improvement if you are typically buying supermarket tortillas. But if you are lazy, or you only have one pan and you’re using it to make your eggs, you can also do it in the toaster or the oven. In a toaster oven/actual oven, set the temp to broil, and, watching constantly, place the tortilla directly on the rack. When it starts to brown, flip it and toast another few seconds. In a pop-up toaster, fold your tortilla gently so it doesn’t tear, in half or quarters depending on the size. Set the toaster to the lowest setting. When it pops, carefully remove the tortilla using tongs or, my preferred method, chopsticks. Toast two 3/4″ thick slices of brioche, lay down a slice of muenster* on one slice while still warm, and set aside – this bread does not need butter, it has enough butter in it to brown beautifully on its own. Place a skillet (any frying pan with a heavy bottom) over medium-high heat. Once it has come up to temperature, swipe butter around the center of the pan. Tear 2 stalks of kale into small pieces and place them in the skillet and season with salt and pepper, moving them just enough to begin to wilt them, then arranging them in a small circle – the circle should be no wider than your bread (about 5 inches, most likely), with space in the middle, about 3 inches across. Slowly crack an egg into the center of the circle – I mean slowly. Let the white drip bit by bit out of the shell so that it cooks in stages and doesn’t spread to quickly. Allow the white to spread under and catch the kale so that the whole thing forms together. Season the top of the egg with salt, fresh pepper, and paprika. Allow the egg to cook for a couple of minutes – it will pop and sizzle from the bottom, but the white will remain translucent and the yolk jiggly for quite a while. Allow the bottom to develop a nice bit of marbled brown crust – if the kale is starting to brown a lot before the white has set, put a lid on the pan to encourage the top of the egg to cook faster and to create moisture that will prevent the bottom from burning. Once the white is opaque and the yolk has started to firm up, flip the whole egg and kale disk. Do not press down, just let it cook for another 30 seconds to a minute, depending on how solid you want the yolk to be. Transfer the egg off the heat onto the cheese side of the bread and close it up. *Meunster is a highly underrated cheese – it’s tangy, salty, and it melts perfectly. But a goat cheese would also be great here. My point is, try for something a little more creative than American, cheddar, gouda, or swiss. Variation: If you are my husband and you think kale is the devil, you can still make over-medium eggs this way. The important thing is the heat of the pan (hot, but not roaring), the amount of fat (butter, which stays in one place, and just enough to lubricate without causing too much bubbling), and the time (longer than you think). But just egg and cheese might be boring to you and you might decide to switch it up by spreading raspberry jam on the other slice of toast. This sounds weirder than it is (think Thanksgiving sandwich), and if you want to be fancy about it you could make it chutney, or if you want some pretense of health you could make it a couple of slices of quickly sautéed apple or fresh strawberry.